A wonderful authentic Irish Bar & restaurant with award winning food. 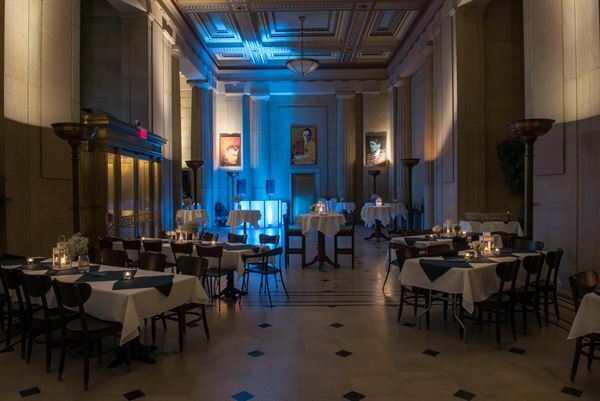 We have a luxurious private atrium with 25ft marble & granite ceilings that we can host private events for up to 200 in. Have a bigger party? We can close down our main bar & restaurant that can hold an extra 280 people comfortably. We can supply top of the line bands, DJ's, comedy acts, facepainters, and anything else you may want to have to make your event perfect. We have hosted several weddings ceremonies, rehearsal dinners, yoga classes, Halloween Parties, New Years Eve Parties etc. We can set the atrium up to suit any style or theme that you need. Call or email us today! Attached is an idea of how we can offer both food & beverage options but get in contact with us, tell us what you want & we will make it happen, that's a promise! We hosted our university organization's Spring Formal event at Tir na nOg's event space, and it was very beautiful and was a perfect accommodation for ~140 people for 3 hours. The wait staff and the manager were so kind and made sure we were able to play music, serve food, and even gave us extension cords for our photo booth. The food that was catered by Tir na nOg, everyone liked, and when we unexpectedly ran out of food, Tir na nOg allowed us to purchase more on the spot and quickly adjusted to our request. Overall, I would highly recommend this space to whoever is looking for a classic, but affordable event space. Hamilton Farm began in 1911 as an English country estate with a vision of elegance and sophistication. Over hundred years later this same vision lives on and can become yours. It is our mission to continue to carry on this legacy and we achieve this through gracious service and hospitality. All our wedding events include use of our space and a full catering staff. The Mansion, adjacent lawn, newly restored garden, and new ballroom are available spaces for your wedding event. We invite you to celebrate your memorable occasion with us and become part of our rich traditions here at Hamilton Farm.